To send emails to contacts through the CRM, or use the sales tools in your email inbox, HubSpot needs permission to connect with your inbox. Learn more about the complete list of features that require a connected inbox. The instructions in this article are specific to connecting a personal inbox to HubSpot in order to send one-to-one emails to contacts, or to use the sales tools in your email inbox. If you want to correspond with contacts through a shared team email in the conversations tool, learn how to connect a shared team inbox. In the Domain Name field, enter your email domain. This is the part after the @ symbol in your email address. For example, if your email address is example@hubspot.com, your email domain is hubspot.com. After entering your email domain, click MX Lookup. If your email service provider is Google Apps, you'll be connecting a Gmail account. If your email service provider is Office 365, you'll be connecting an Office 365 account. If your email service provider is something other than Google Apps or Office 365, then you can connect your account via IMAP. Please note: HubSpot does not support a connection with ActiveSync, but if you use ActiveSync in your email client, connect your account using the HubSpot-Exchange connection. Please note: if you connect a Gmail inbox that has an alias set up, that alias will show up automatically in the From dropdown menu in the email composer. The alias must be set up in your Gmail account before you connect your inbox. Read through what to expect when you connect your Gmail inbox to HubSpot, then click Continue. You'll be prompted to log in to your Gmail account. Enter the email address of the Google account you want to use. If you're already logged into one or more of your Gmail accounts, choose the account you want to connect. Review the required permissions, then click Allow. 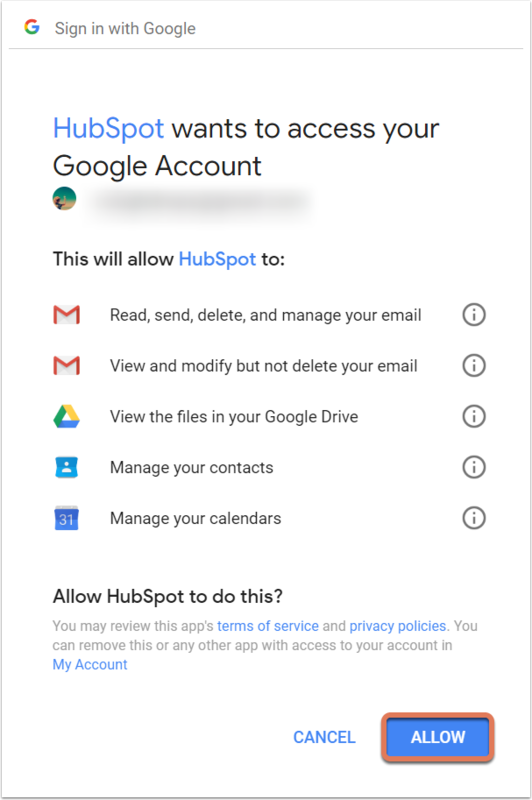 You'll be redirected back to your settings, and a dialog box will appear to inform you that your Gmail inbox is now connected to HubSpot. You'll be prompted to log in to your Office 365 account. Enter the email address of the Office 365 account you want to use. If you're already logged into one or more of your email accounts, choose the account you want to connect. Before connecting your inbox via IMAP, review the technical requirements with your IT team to make sure you can connect. You can also review the HubSpot Sales privacy overview before connecting. Please note: if you are trying to connect an email account to the conversations inbox, you need to connect an inbox that is hosted with either Gmail or Office 365. Conversations does not support an IMAP connection. Please note: if your email inbox uses two-factor authentication, you'll need to enter a third-party app password. Review documentation from your email provider (e.g., Yahoo Mail or iCloud) for instructions on how to generate a third-party app password. Learn more about connecting your inbox with two-factor authentication on the Community. 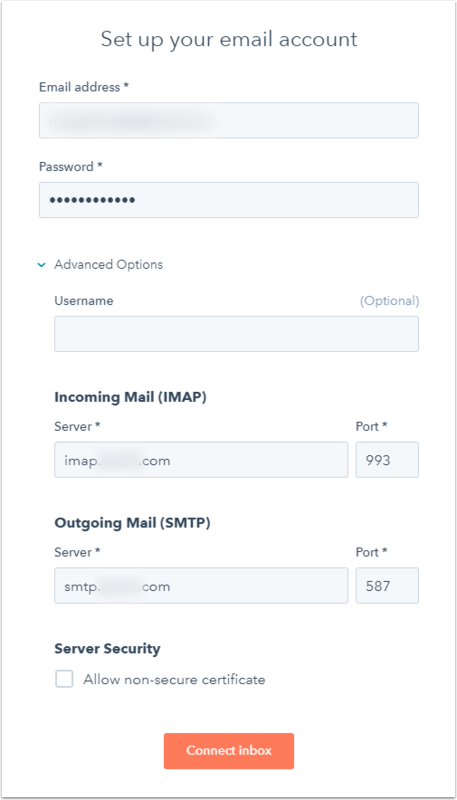 If not, click Advanced Options and enter your server's information: Username, Incoming Mail (IMAP), and Outgoing Mail (SMTP). You can also select the checkbox beside Allow non-secure certificate if necessary. Learn how to find this server information in your email client. Your connection will be verified and completed, and a dialog box will appear to inform you that your inbox is now connected to HubSpot. Before connecting your Exchange inbox, confirm with your IT team that your Exchange server is running Exchange 2010 SP2 and above. 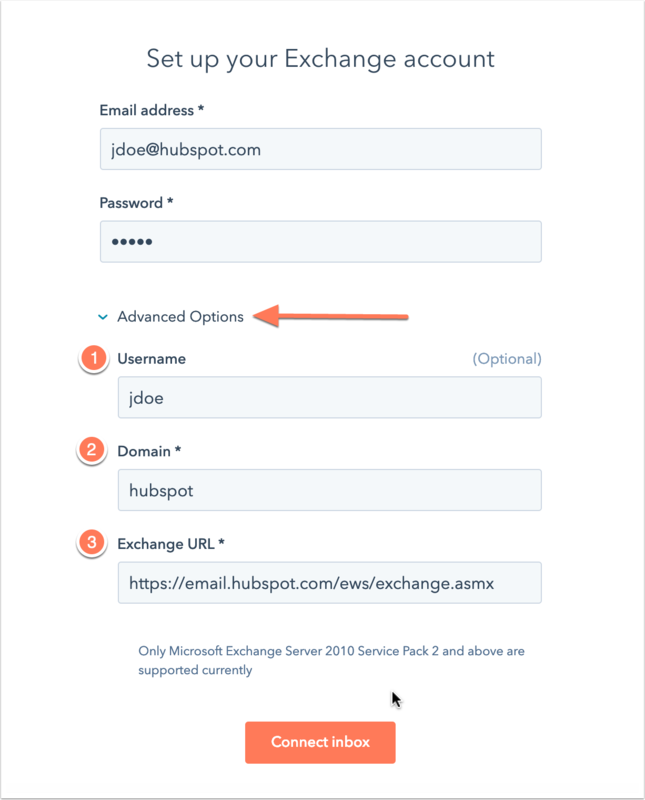 Your Exchange email address and password are required in order to connect your inbox, but depending on your Exchange server’s configuration, HubSpot may require additional information to connect. Refer to the table below before connecting your inbox to make sure you have all of the necessary information. In the dialog box, select Exchange. Read through what to expect when you connect your inbox to HubSpot, then click Continue. You can also review the HubSpot Sales privacy overview before connecting. Enter your Exchange Email address and Password, then click Connect inbox. Username: enter your username. Typically, this is what is listed before the @ symbol in the email address, or your user ID. Please note: when logging into an Exchange server, you most likely enter a full username. The full username will either be the email address or will be formatted as domain\user. In HubSpot, enter the user value in the Username field and the domain value in the Domain field. They will both be combined as the full username when logging into your Exchange server in order to connect. Domain: enter the Windows domain used to log into your businesses network. Exchange URL: enter the URL used to access your Exchange server. Please note: the Exchange URL of your Exchange server will always be formatted as https://mail.domain.com/ews/exchange.asmx. If you're not sure what to enter, log into your Exchange mailbox from a web browser, then copy the URL and paste it into the Exchange URL field. HubSpot will be able to detect and recommend the correct Exchange URL. Your connection will be verified and completed, and a dialog box will inform you that your Exchange inbox is now connected to HubSpot. Please note: when HubSpot connects to your Exchange account, any folders that associated with your inbox rules sync with HubSpot. If you add a new inbox rule to move emails into a new folder, you will need to reconnect your inbox in order for HubSpot to detect the new inbox rule.